If you, like me, have been coping with Tuesday's shocking election results by consuming every piece of information you can find in an effort to be as educated and prepared for what's next as possible, you might have come across an interesting new term on Twitter on Wednesday. It's being thrown around by West Coast residents, and it's important, so let's talk about it. What is "Calexit"? Well, it's the name that's been given to the desire of a growing number of Californians to secede from the United States in the wake of Donald Trump's win, and it's equal parts joking and serious. California is a true-blue state, essentially guaranteed to go Democratic in any election, and Nov. 8 was no exception. Where many other traditional Democratic vanguards were unexpectedly contested or went to Trump entirely, California was never questioned. Their polls closed at 11:00 p.m. EST, and by 11:01 p.m., CNN had called the state and its 55 electoral votes for Hillary Clinton. According to The New York Times , Clinton got 61.4 percent of the vote in the liberal stronghold, compared to Trump's 33.3 percent, so California's experience of Election Night was very different from the rest of the country's. 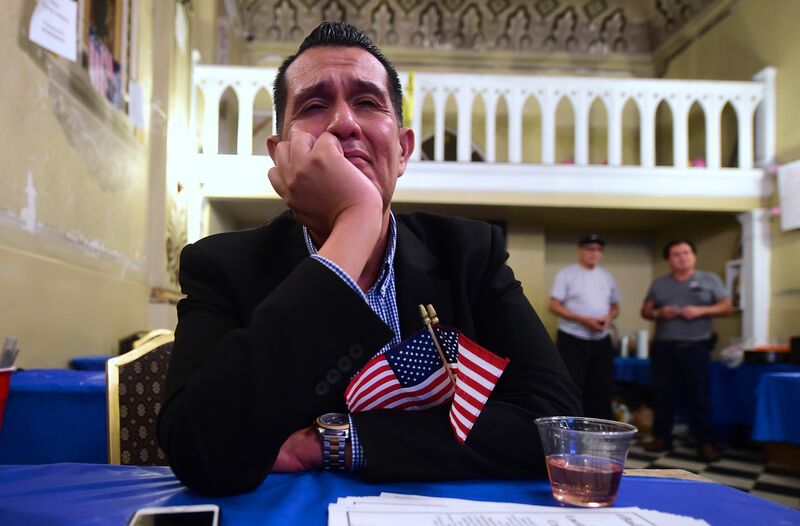 California voters watched, baffled, as swing states fell to Trump, and, by Wednesday morning, that bafflement had turned to anger; many residents felt like the differences between their views and those of their fellow citizens were too disparate to overcome. Thus: secession. Why not? As many have pointed out, California has a robust economy in its own right — the sixth largest in the world, in fact, as Fortune points out — and is one of the few places on Earth that grows enough food to sustain itself. So why not simply take themselves out of the United States, and, more importantly, this Trump presidency, and leave it for the portion of the nation that actually chose it? "In our view, the United States of America represents so many things that conflict with Californian values, and our continued statehood means California will continue subsidizing the other states to our own detriment, and to the detriment of our children." Many states have threatened to, but none have actually seceded since the Civil War. However, that doesn't mean you should count Calexit out. Even the term itself — "Calexit," although some are also using "Califrexit"— was modeled after the word "Brexit." You know, the name given to Britain's stunning decision to leave the European Union earlier this year. That was an initiative that many refused to take seriously until it actually passed, so it's important that no one makes the same mistake here. Listen to people. Try to hear what they're actually saying instead of just writing them off or dismissing them. There's a lot of frustration latent in not feeling heard or represented in your own country, so, while I do hope that California stays and continues to engage with the political process instead of detaching from it, I certainly understand the impulse.